This topic contains 17 replies, has 8 voices, and was last updated by Barry 3 weeks, 6 days ago. 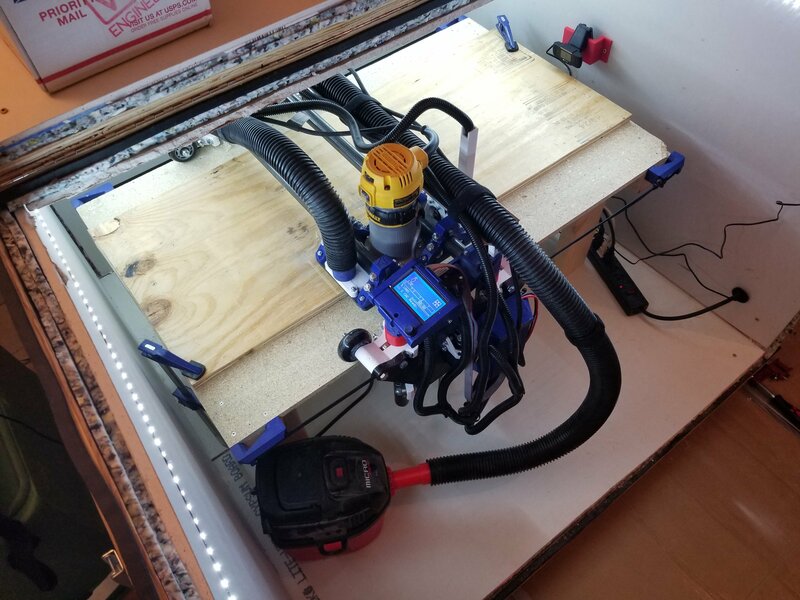 I’ve built my LowRider 2 CNC and its enclosure. I live in an apartment with an attached garage, so I need to keep the noise down. 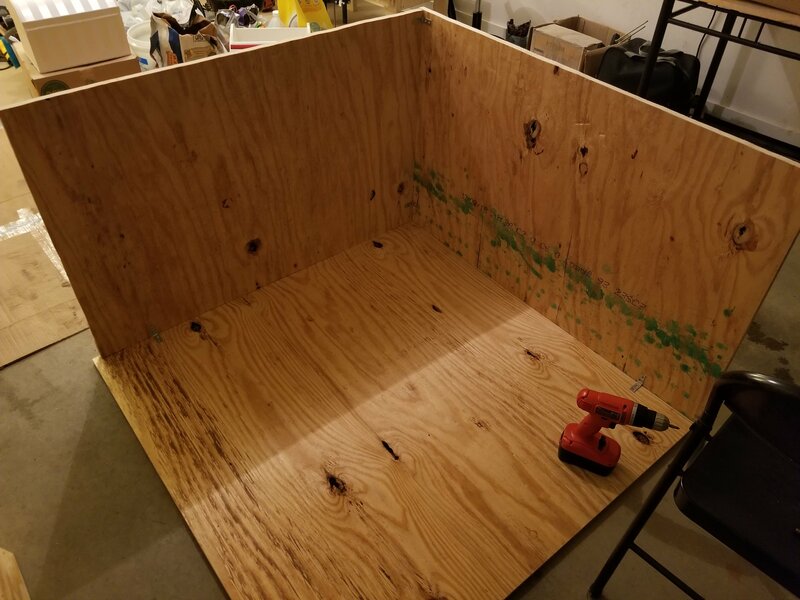 The table I built is 39″ by 24″, which gives me a cutting area of 24″ by 16″ and makes it small enough to fit in a 4′ by 4′ enclosure. 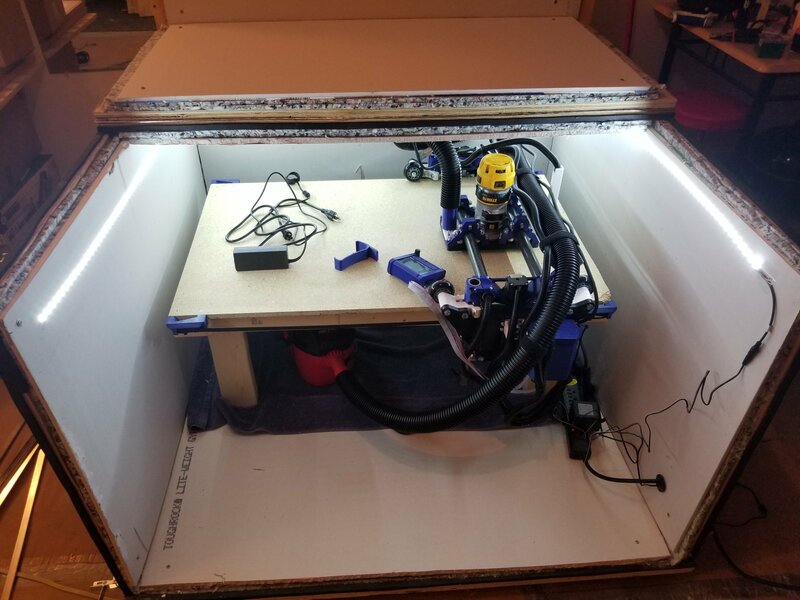 Once I my wife and I buy a house I can get rid of the enclosure and make the CNC bigger. 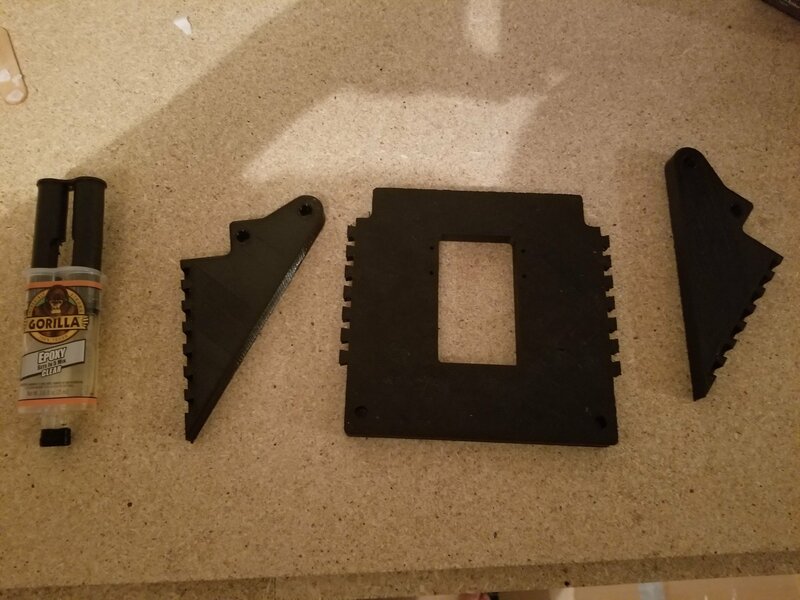 I 3D printed the flat parts. The sides were too big to print in one piece on my Prusa i3 MK2 so I printed each side in 3 pieces and used epoxy to glue them together. Here’s what it looks like after I finished building it. Over Christmas I brought it to my parent’s house and did some cuts. Without the enclosure, when the CNC and vacuum were running at my parent’s house it was around 76 dB. With the enclosure it goes down to about 50 dB. 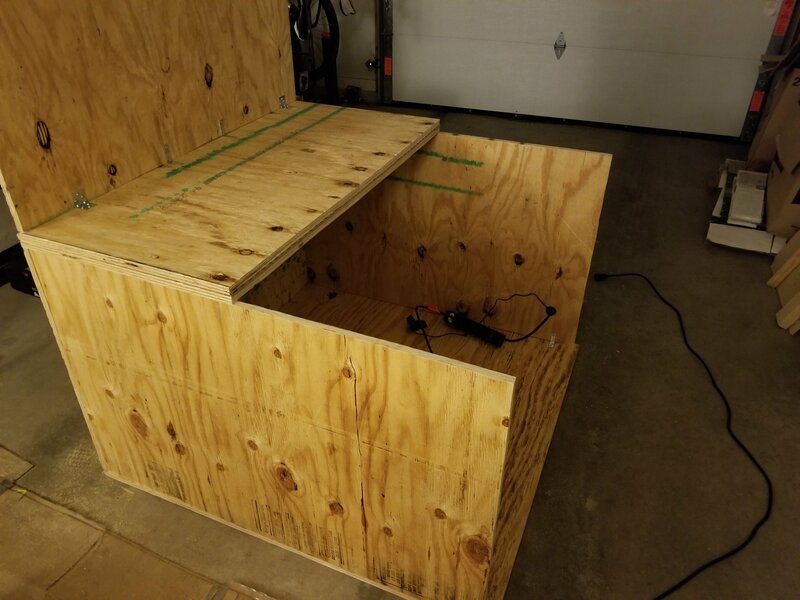 I got the idea for the enclosure design from this blog post. That is a very slick build. Thanks for sharing. I couldn’t find any pipes that were exactly 1″ OD. I had to get some pipes that had 1.06″ OD. Even that was enough to make it so I had to modify some of the parts. I modified Estlcam to always add “G92 X0 Y0 Z0” to the top of the gcode files to set the current position as the home. I found that if I didn’t do this I it wouldn’t cut in the spot I wanted it to. 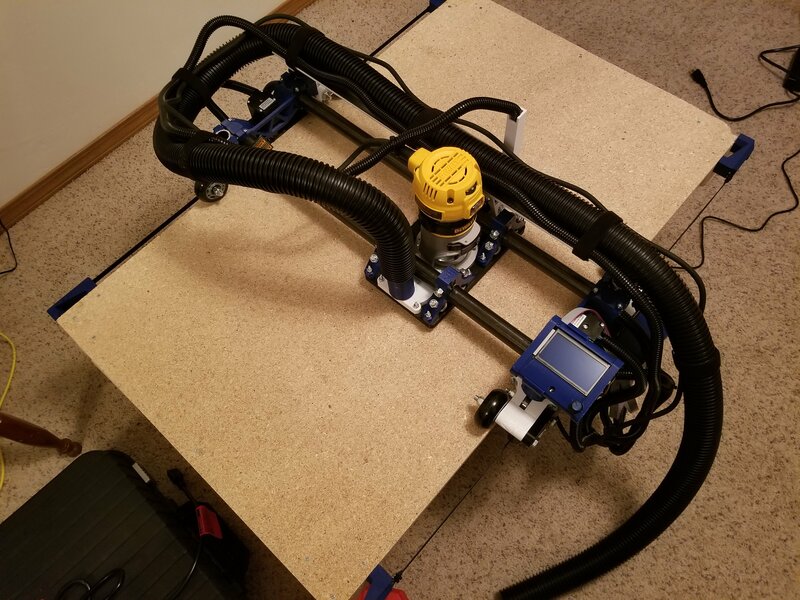 If I increase the Z and then just leave the machine idle for a while (about 15 minutes) it seems that the Z axis motors just turn off, which causes the CNC to drop. When I cut the power to the CNC, the CNC lowers unevenly and could possibly cause the bit to smash into the table. 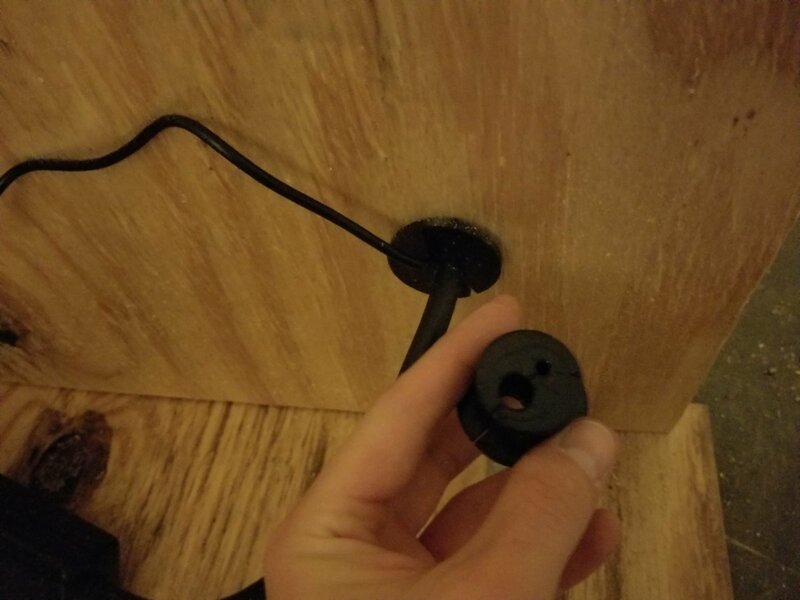 To make sure the bit doesn’t smash into the table I 3D printed some spacers (the red thing in the image below). Additionally the spacers are at the exact height I want so that I don’t have to raise or lower the Z when starting a new cut. So when I got the notification from USPS that the bundle had been delivered I went out to my mailbox a few hours later to get it. It wasn’t there. I was very, very mad because it’s such an expensive package. I immediately drove to the post office and asked them about it. The manager said that he’d ask the mail person the next day about it. On my way back home, I stopped at the mailbox again. I thought that maybe she put it in one of the package lockers and forgot to put the key in my mailbox, or maybe she put the key in someone else’s mailbox and maybe that person opened the package locker already and just left the package. I checked all the package box and sure enough, it was in one of them. I never received one other package last year, and almost lost this one. I think from now on if I order anything expensive I’m going to just have them hold it at the post office. So far I’ve had to turn the router and vacuum on with the enclosure door open, then quickly shut the door. So there is a lot of noise for about 5 seconds. So what I’m going to do is reprint the gaskets so that I can fit 2 cords (plus the webcam wire). One cord will power the router and vacuum, the other everything else. 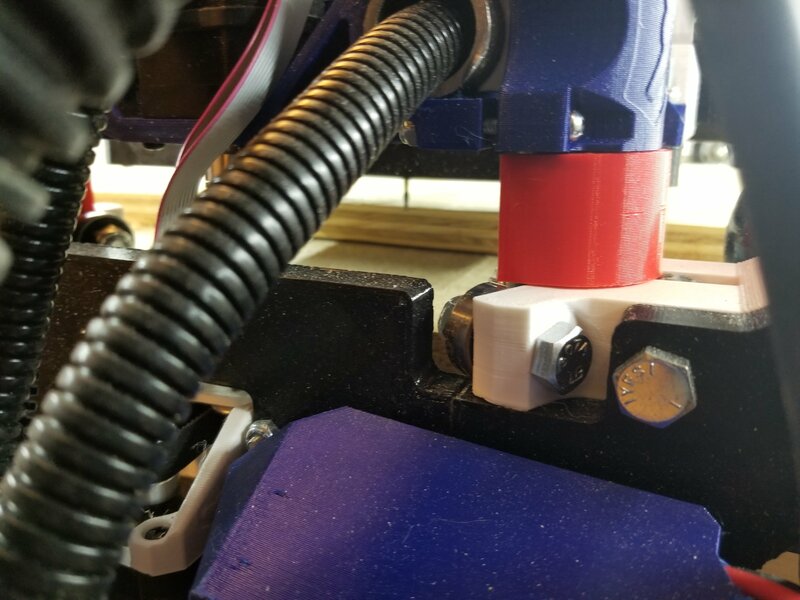 I modified Estlcam to add “G4 P60000” at the top of my gcode files, which delays the cut for a minute. Having that minute will give me plenty of time to start the cut via the LCD screen, close the door, then plug in the router and vacuum. Then there won’t be any brief loud noises. I don’t really like the LCD attachment (the part that is zip tied to the Z axis motor). I might redesign the Rambo case so that the LCD can be put on the top or the side. I also might try this Rambo box instead. I’m going to set up the webcam in the enclosure to stream using my wifi. I have an USB to micro-USB adapter for my phone, so I connected my phone to the webcam. I downloaded an app called IP Webcam which immediately recognized the webcam and started streaming it. Then using VLC I was able to watch the stream on my computer from anywhere in the apartment. 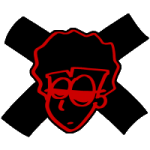 I have a Kindle Fire tablet that I downloaded the Google Play store onto, so I’ll probably use that to stream instead of my phone. Thank you Ryan for making the design available to everyone. And thanks for the shop and making it so easy to order all the parts. That soundbox is amazing! Glad you like it….but now you really have me considering a box build. You really shouldn’t leave a cnc alone. If the bit dives into the work, it’s a matter of seconds before it will start a fire. I was literally installing a smoke alarm above mine in the garage when I smelled burning and saw that it had scorched my work. No noise from the alarm. That awesome enclosure will be plenty of fuel to burn your whole apartment complex to the ground. It’s not any more dangerous than other power tools, but you’d never start your table saw and then walk away to do something else. Thanks Ryan. 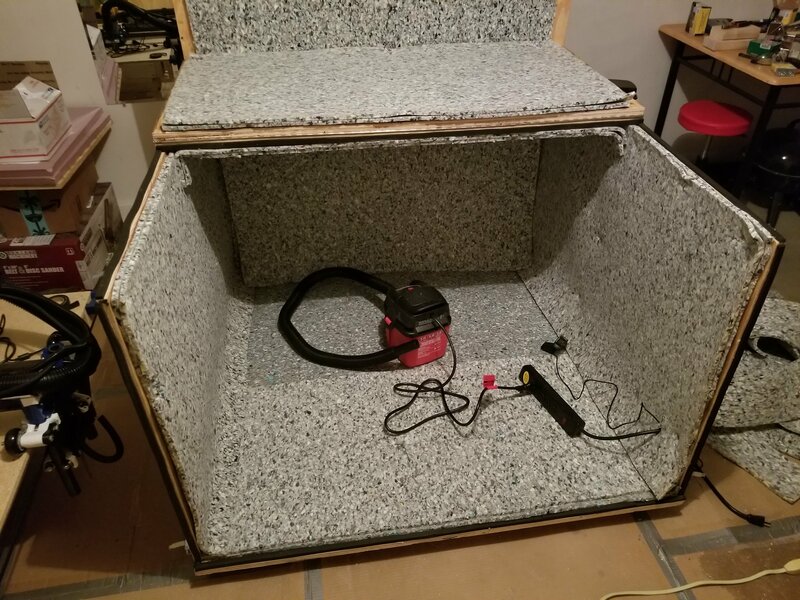 Are you considering building one just to keep the noise down in your workshop? Jeff, you’re right, thanks for the advice. I’ll stay in the garage while the CNC is running. The cuts I’m planning on doing shouldn’t take a long time, so I won’t have to watch it for very long. I’m also going to buy a fire extinguisher and keep it next to the enclosure. I’ll also buy a fire alarm and install it inside the enclosure. I can still use the streaming while I’m inside the garage. I can sit at my table in there with my laptop and stream the video feed, instead of using a really long USB extension cord. When I cut the power to the CNC, the CNC lowers unevenly and could possibly cause the bit to smash into the table. That will disable turning the steppers off after a job (assuming no other M84 commands). 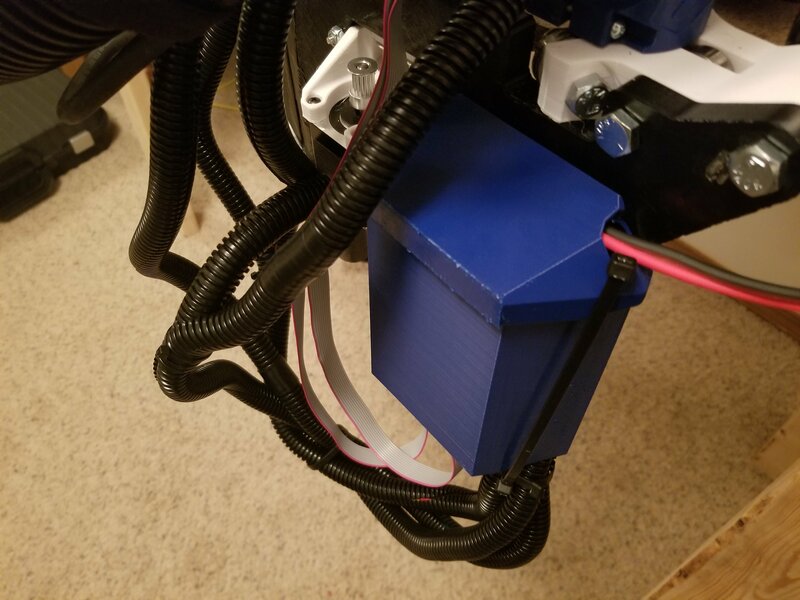 I have a startup script that lifts off a squaring jig and moves Z, then X and Y (and also disables the motor timeouts) so everything gets locked and synced up. I second the burning wood comments — please don’t leave unattended. https://www.harborfreight.com/power-maintained-foot-switch-96618.html ? Seems pretty nice, actually. I would use this all the time. That’s the one — 15 amp — so I can kill shop vac, router, and mini rambo. Thanks for the tip on the M84 S0 command Jeb! 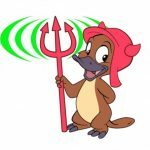 Where did you source the pipe? What modifications did you have to make? Hi Jaren. Sorry for the late reply. I’ve been out of town all week. I got the pipes from Menards. They’re thicker and heavy, so I wouldn’t recommend using them since it puts more strain on the Z axis motors, but they’ve been working fine. I had to modify the LR2 X Mount, XZ, XZ Main, XZ Side Belt, and VacShoeBack to make the space for the tube a little larger. couldn’t find any pipes that were exactly 1″ OD. I had to get some pipes that had 1.06″ OD. I got the pipes from Menards. That is ~.120″ wall thickness (and ~1.050″ OD) which as you noted is quite thick and a bit oversized. It’s been mentioned a few other places, but might be worth reiterating here: “pipe” is sold by the ID and “tube” is sold by the OD. What the LowRider needs is 1″ steel tubing, not a 1″ (or 3/4″) pipe. 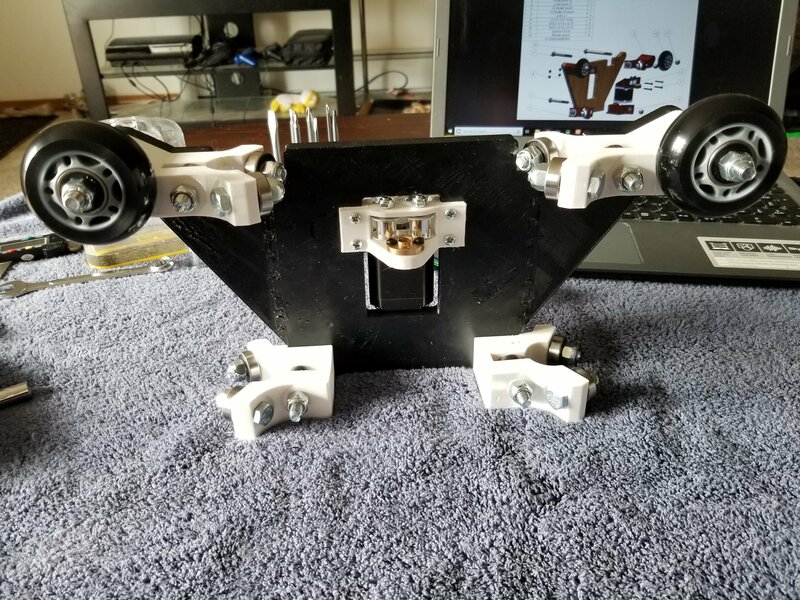 @alex, How are the 3D-printed flat parts working out? 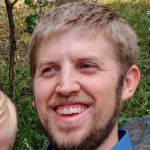 Do you have those .STL files available anywhere? I too have a Prusa i3 MK2. I see that the parts are still out of stock so I’m considering alternatives. I thought about printing this router template: https://www.thingiverse.com/thing:3364669. Your 3D-printed flat parts look intriguing though. I still have like 80+ hours of printing the main parts so I’m patiently evaluating the flat part issue. Hi Tim. Yeah I’m still using them and they seem to be holding up without any issues. I didn’t upload the stl files anywhere, but I still have them, and the project file (I used Designspark Mechanical). I can upload those files to Thingiverse tonight. Now that you have it working, might be a good idea to cut out the flat parts, just in case. With the router and vac running in there, it’s going to get hot. Might warp the printed parts.